I think I went to the gym on Monday. I definitely went to track in the evening. This week’s session was an evil concoction of Bob’s involving long reps broken down into alternate stretches of tempo and fast running. So the first was 1200 broken in to 300t, 300f, 300t, 300f. Then with 400s, then 500s, then 400s and 300s to finish. It was unpleasant and I was too slow to keep with my normal group (which adds evidence to the feeling I went to the gym in the morning). On Tuesday I did a spin class at Withdean Gym with Rob, who turns out to be a total spinmeistergeneral, who put me to shame. However it was good for me to do something different and notwithstanding the Wiggoesque nature of Rob I still worked hard. Having cycled on Tuesday I needed to get a LSR in on Thursday so this I duly did. It was long and slow and a run so success! Managed 13 miles on the seafront at an average pace of 8.43 which I was pleased with especially as it was rather windy and I’m still not fully back to routine long runs. In the evening I went to the Arena Hove Park intervals session that I haven’t been to for ages. I was a bit worried I might be dead after the morning but in fact I was not and put in a good session. Perhaps not particularly fast but I put in the effort which is the main thing. On Friday I definitely did go to the gym. I really wanted to go up a notch on the leg press but due to Thursday double day I wasn’t able to. However I did all the usual stuff so that will do. 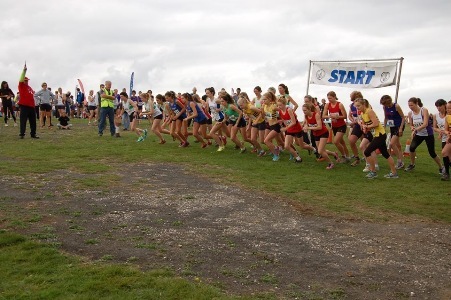 Today (Saturday) it was the Goodwood Cross Country relay which heralds the start of the cross country season. It’s always strange when this race is run in hot and summery weather but it was once again this year. This time I ran 3rd leg which I don’t think I’ve done before. It meant that I was running by myself but there were a few people within catching distance and in fact I overtook 4 people which I was pleased with. I was pleased with my run as a whole as I tried throughout and for the first time EVER felt like I actually RAN up the hill. Hoorah! All this gymming is paying off. The leg one ladies are off! Thanks Tom for the photo. I think my time was roughly 20 seconds slower than my PB which is good as I’m still not back into full long run mode and I was not motivated by being on leg one and surrounded by people or by having been given a MASSIVE head start, meaning I was in the lead and being terrified of losing it. A pleasing week and 27 miles in the bag.